The Morey family celebrate a tradition of winemaking which spans five centuries along the steep banks of Mosel River. Their 2½ hectare vineyard on the outskirts of Beechworth now yields a quality of fruit which would have done the ancestors proud. The Gamay grape traditionally makes a light bodied fruity wine, its thin skin offers little tannin, for a style which drinks superbly on release. 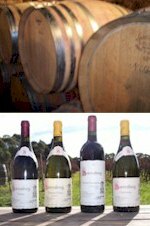 Sorrenberg work to a combination of Burgundy and Beaujolais techniques, producing an even more engaging wine through the inclusion of a soupçon Pinot Noir. Barry and Jan Morey selected Beechworth for it's cool climate and favourable granitic soil, the undulating site providing good drainage while the northern aspect ensures full ripeness is achieved. The name Sorrenberg comes from a small vineyard near a town called Reil on the Mosel. Sorrenberg's fruit is picked cold throughout the early morning, half of the Gamay is macerated, crushed and left to soak for several days before the onset of fermentation, a further component is vinified as whole berries. Inoculated by natural yeasts and vinified over the course of a fortnight on skins, after which time batches are pressed and filled to a selection of oak barrels for eleven months maturation. Purple red hue. Ripe cherry nose with a hint of berries and spice. The fruit follows on to the palate with warm spicy overtones. Well balanced palate, a soft fruitful acidity fuses with finely grained, well proportioned tannins that support a classic peppery mouthfeel. The silkiness up front combines with the fine grain tannins to give good length on an overall luscious mouthfeel. Approachable upon release and will develop deeper savoury characters if aged.